If asked, most peoples’ impression of the Crimea War could be characterised as inefficient bungling and heroic disasters, where more died through disease and neglect than through battle, which is perhaps true. However, while the Royal Navy played a predominantly supporting role during the land campaign, there is one aspect of the war that was a resounding success, but is not well known. This was acted out in the Sea of Azoff, with the Royal Navy as the principle player. The Sea of Azoff is effectively a shallow inland sea, accessed via the Kertch straits, a narrow waterway that opens off the Black Sea, to the north east of the Crimean peninsular. The significance of this waterway to the besieged Russians in Sebastopol was that it provided a waterborne route along which much needed supplies could be delivered to their armies. While it is true that Sebastopol was never completely surrounded, supplies, via the Azoff Sea, provided an important logistic link with the rest of Russia. To disrupt this supply route, and hopefully hasten the end of the siege, a plan was conceived that would see the strategically important town of Kertch captured, providing the allies with unfettered access to the Sea of Azoff. This objective was achieved in May 1855. Once the navies of France and Britain could freely enter the Sea of Azoff, the destruction of both the transport craft and stores stockpiled at strategic points around the coast could begin. The nature of this campaign, and the shallowness of the sea, meant that the smaller steam warships from both navies were better suited to this role than the larger Line Battleships. However, this does not mean that the larger ships did not make a contribution to this campaign. Following a successful raid by boats under the command of Lt. MacKenzie at Grenitchi on the 29th May 1855, an attack was planned for the 3rd June 1855 on the port town of Taganrog, in the Gulf of Azoff. In addition to the involvement of the smaller ships such as Stromboli and Snake, the launches and gigs from the battleships St Jean D’Acre, Agamemnon, Princess Royal, Royal Albert and Algiers, together with their crews, would also take part in this raid. It is perhaps worth noting that the majority of the 60 odd seamen in the boats from Princess Royal were Coastguard Men. Most of these men had been called-up for service in the Baltic Fleet in 1854, but had remained in Princess Royal when she sailed to the Black Sea for service in the Crimea. Since these men tended to be older and have prior naval service, it is reasonable to assume that this was not an accident. This type of operation required skill and a steady nerve, both of which CG Man, who were used to small boat actions, would possess in full measure. These ships boats were towed to just off Taganrog by the smaller steam warships on the 2nd June. Although these boats were armed with 24pdr howitzers and rockets, Captain Coles, of HMS Stromboli, proposed that a raft be constructed mounting a single 32pdr 42cwt gun to provide close support for the attack; because the water was so shallow even some of the smaller warships were unable to come in close without the risk of running aground. Like Princess Royal, a substantial number of Stromboli’s crew consisted of CG Men called up for service in the Baltic. It is therefore likely that a number of these men were involved in this attack, even possibly manning the raft, now christened the ‘The Lady Nancy’. The attack commenced on the 3rd June, with a boat being sent in under a flag of truce to demand the surrender of all Government property, all of which was to be destroyed. The 3,500 troops in the town would be required to withdraw while this destruction took place. Unsurprisingly this demand was refused. Shortly after this refusal HMS Recruit commenced firing, and the flotilla of ships boats made their approach on the town. Despite the Russians best efforts to oppose the landing, the fire from the boats prevented them from mounting any real opposition. Parties of volunteers were then landed to set fire to the buildings and stores. By 3pm all the stores of grain, timber, tar, all the boats in the harbour and any boats under construction, together with the Customs House and the main Government buildings were ablaze. Although the Russians were seen to suffer a significant number of casualties, only one man from the attackers was slightly wounded. This action attracted much praise from the Admiralty, and while many such raids were carried out successfully none was as large as this. After the war the Russians were to acknowledge that these attacks seriously undermined their determination and ability to maintain the defence of Sebastopol. 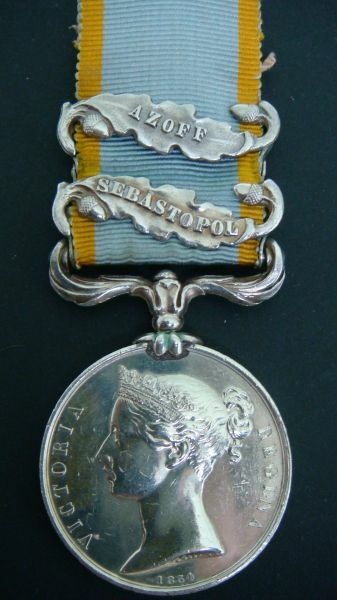 Any man who served in this campaign qualified for the ‘Azoff’ clasp, attached to his Crimea Medal. This clasp was awarded only awarded to men from the Royal Navy, and there would have been many Coastguard Men back on normal duty that would have worn their Crimea Medal with pride.